Shinzō Abe won Sunday’s snap election easily. His Liberal Democratic Party (LDP) together with coalition partner the Buddhist-backed Komeito party won 325 seats out of 475 – LDP 290 and Komeito 35. With the Prime Minister’s economic program, dubbed Abenomics, clearly not delivering what he had promised, this was a disastrous and embarrassing result for the opposition parties. On Monday, Banri Kaieda, leader of the country’s biggest opposition party, the Democratic Party of Japan (DPJ), announced his resignation. His party only managed to win 73 seats, which was eleven up on two years ago, but clearly nowhere near enough. Mr. Kaieda even lost his own seat in his Tokyo district. It is the first time since 1949 that the leader of a major opposition party lost his seat. 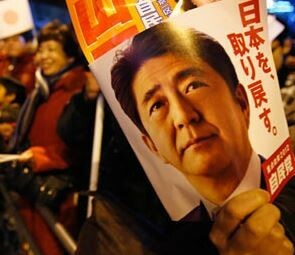 Japan’s splintered opposition has been a blessing for Mr. Abe, who two years ago crushed them in a humiliating defeat. Shinzō Abe now has a mandate to postpone next year’s second sales tax increase. After nearly half a century of virtually unbroken rule, the LDP was unseated in 2009 by the DPJ. It only lasted three years, during which time the country had three prime ministers. When Mr. Abe came into power in 2012, he tried to kick start the economy by increasing public expenditure and printing money. Initially, his policy, nicknamed Abenomics appeared to work and the economy grew. However, it was not long before the whole thing lost steam and the country slid back into recession in the second half of 2014. Many economists blamed the slowdown on the increase in sales tax in April from 5% to 8%. Japan has the highest public debt among the advanced economies and the government has to increase its tax revenues to reduce it. Mr. Abe, who wants to delay the second sales tax increase (to 10%) scheduled in 2015, says he called an early election to get a mandate to do this.